This review is available now on Cruise Critic at http://www.cruisecritic.com/memberreviews/memberreview.cfm?EntryID=506152 and on Cruiseline. Three of us travelled: my husband (Tom), our adult son (Michael) and myself. 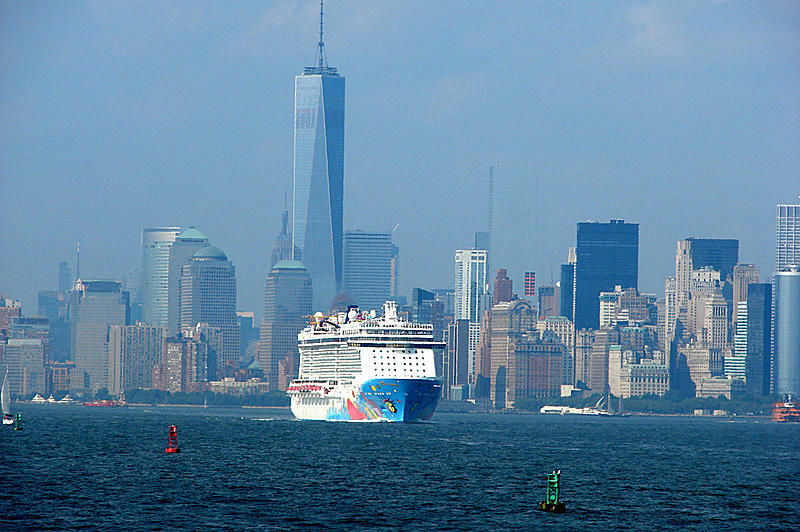 I’ve been on several cruises – NCL, RCI, Celebrity, and some Windjammers. My husband NCL, Celebrity, and some Windjammers; and our son one other NCL. Our son lives and works in Manhattan and we had seen the Breakaway when we were visiting him in November. I chose this particular week because it included my husband’s birthday. My husband and I took Amtrak from DC on Friday and stayed at a hotel in SoHo for 2 nights. We had used RCI points so there was no cost for the hotel. On Sunday, our son and I were playing in a recital at the temporary Steinway Hall at 11:00 am and this worried me a lot, getting from 1155 Avenue of the Americas to the cruise terminal by 2:00 all aboard. We left Steinway about 12:15 and took an Uber to the terminal. The driver left us the terminal by the Gem about 12:35 but it was an easy walk next door to the Breakaway terminal at Pier 88. We left our checked baggage and went through the terminal process very quickly. We never even had a chance to sit down and we were on board by 1:00. That was the fastest I have ever boarded any ship. The Garden Cafe was crowded but we found a table without much effort. Before we finished eating, it was announced that the cabins were ready. Our cabin – 9918 – was fantastic! It was a bit tight for the 3 of us but we made it work. As it turned out, looking out over the balcony, we could see the fireworks just fine. There was a lot of storage but some was tricky to find. The bathroom was a good size, as was the shower. There were more shelves in the bathroom than usual and I liked being able to leave my cosmetics and stuff in there. I had read that there was no conditioner in the showers so I brought my own. I also followed advice from Cruise Critic and brought magnet hooks for the walls and those were great for hanging hats, card lanyards and so on. Giant clips, meant for holding towels to chairs were repurposed for clipping our last day paperwork under the TV. About the TV – we never watched it so we can’t really comment on the programming. 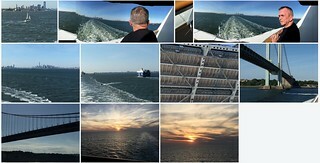 We did watch the info from the deck once or twice to find out about the sea conditions. Our bed was great, very comfortable king sized with 2 pillows each. The steward, Bradley, turned the couch into a nice bed for our son. When we were in the elevators, they were clean. Both of the RCI cruises I took had sticky elevator buttons, presumably from children using them after eating ice cream or something. One thing that RCI has that I would like to see on other ships was the “day plate” on the floor. Often, I get involved in a cruise and have no idea what the day is, so that would be helpful on all ships. Everywhere we went, crew was smiling and friendly – and everything was very clean. At the end of the cruise, we took the behind the scenes tour and everything was so well run. Amazing. We mostly ate in the Garden Cafe. We also ate once each in Taste and Savor. Our specialty restaurants were Moderno Churrascaria, Teppanyaki and La Cucina. We had been at the Churrascaria on another Norwegian cruise and loved it. This time, we knew not to eat too much earlier in the day! This time, I went lighter on the salad bar portion. The “gauchos” (aka waiters) brought sausages, lamb, both beef and pork ribs, chicken, filet mignon, and garlic beef, among others. Of those, I had the sausages, lamb, chicken and beef before I was too full. All excellent. Michael gave up even earlier than I did! For dessert, I had mango rice pudding – nearly as good as Thai sticky rice with mango. Teppanyaki was a pretty standard Japanese food, on this ship cooked by a Philippines chef (he called himself fake-Japanese). Because it was on a ship, with no flames allowed, there was no onion volcano although another chef tried it with an onion and water for steam. Not as impressive as with oil and fire but clever nonetheless. There were combinations of chicken, beef and seafood (including lobster) served with miso soup, seaweed salad, vegetables and garlic fried rice. I had green tea cake/ice cream for dessert and the others had fruit sashimi. La Cucina was good Italian food. The minestrone was unusual (for us, anyway). We got bowls with a little bit of pasta stuffed with vegetables and a piece of Italian bread on top. Then came the “surprise” when the waitress brought around the tureens of broth that was poured over all. We also attended Cirque Jungle Dreams and Dinner. I had read many complaints about the Cirque dinner so we ate in the Garden Cafe a bit before the show. The food (and show) were great. I told the waitress that I was allergic to shrimp so she offered double filet mignon but I declined. My portion was excellent. Tom was using the Internet Cafe one morning so Michael and I played the 15 minute Sudoko challenge. One of the main challenges of that was they gave a blank form and we had to fill in the starting numbers. I messed up some in copying from the big screen and that made it harder to figure out the answers. After that was Trivia and we did ok as a team. The library was very small and open only certain hours. Tom went back later and checked out a book. The library, game room and halls outside were decorated with photos/history of the Rockettes – the “godmothers” of this ship. 2 of them were on board, giving exercise classes, Q and A periods and photo ops. We played Scrabble a few times in the games room and that was fun. Others played board games like Clue, chess, Yahtzee and card games. Michael did the ropes course. I had planned to go, too, but I was wearing sandals and couldn’t go. Tom checked everything out and said he’d try it “later”. Unfortunately, neither of us ever got a chance to try that later. On a different day, Michael also climbed the rock wall. Even if I’d been wearing closed-toed shoes, I wouldn’t have tried that! Our star athlete, Michael, also used the gym all the sea days and reported that it was really good. The treadmills and ellipticals have sudoko and other games to while away the time. We had no use for any of the Children’s Clubs. We didn’t do any entertainment other than the Cirque Jungle Dreams and Dinner which I mentioned above, under restaurants. Tom and I had been to Bermuda on a land stay before but Michael had never been. The first day, we did a bus tour of the whole island. That was very interesting but we had some folks that had trouble getting back to the bus on time. One person ended up being on a regular bus to Hamilton from St. George and we spent quite a bit of time locating her and getting her back with us. If I’d known that would be the, we would have just stayed in St. George and taken the ferry back. Instead, we rushed out lunch to get back on time. The next day, Thursday, we took a bus to BAMZ and the Crystal Caves. When we were in Bermuda before, we’d tried to take the bus from Hamilton to the Bermuda Aquarium, Museum and Zoo but somehow missed the stop. BAMZ and Crystal Caves were well worth the trip. Someday, we will go back to BAMZ when we can spend more time. Friday, I’d arranged for the Restless Native for snorkeling. I had arranged that not through the ship but through CheapCruises and saved $30 per person over others who booked through NCL. I had never done that before so this was a trial run and worked very well. We were back in plenty of time for 4:30 all aboard. This was one of the best snorkel boats we had been on. Shallow enough that I didn’t have to worry about drowning getting back on the ship but lots of caves and coral to support fish swimming around. This sailboat also offered noodles for floating with, kayaking, banana boats and paddle boards. Lots of fun – and boat-made cookies. We were in the “Orange” disembarkation group so we had a leisurely breakfast, went back to the cabin to pick up our carry-offs and down to the Atrium. WiFi still worked so I checked my email and we read. The giant screen was showing the staff singing and waving goodbye to us. There was some hold up at Customs on shore so they stopped offloading for a few minutes, then resumed. Our color was supposed to be called about 10. It was called around 9:45. We were off the ship, got our luggage, through Customs and in an Uber by 10:30. Very fast and efficient. We had a great time overall and wouldn’t hesitate to take this ship again. I loved our balcony! Having only one port was great so we could use the ship as a hotel was really nice. The one “problem” was Saturday night coming back into New York. There was a lot of cabin shaking/noise (remember, we were on 9 aft). I had read about that in one of the reviews so I wasn’t too concerned. I had been expecting noise/vibrating when leaving Bermuda but that wasn’t so bad. Coming back to NY was the loudest/shakiest.